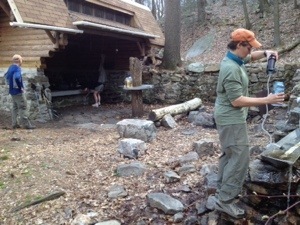 Rausch Gap Shelter, Penn., AT NOBO mile 1172.1, Saturday April 26, 2014 — The theme for next week is precipitation beginning Tuesday. There is a small probability of a sleet or snow mix. Will this winter ever give up? 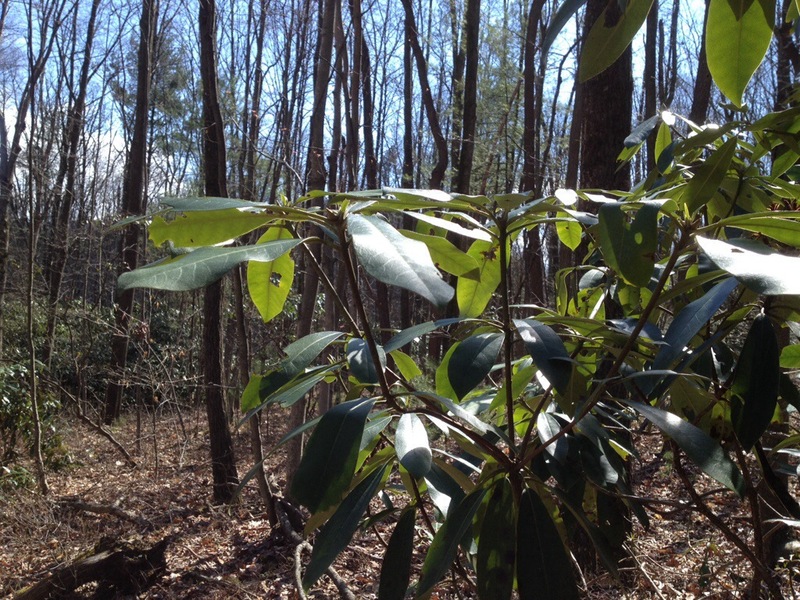 Today I walked through a small cluster of Rhododendrons that I thought didn’t grow this far north. The buds have yet to form. When I last saw them in Virginia, the buds were more than an inch long. Spring has a lot of work to do. I’ll be okay if it snows, but I’m no longer carrying serious winter gear – no base layer, fleece or mittens. I still have a light down jacket and a sleeping bag. I was considering switching in about 10 days from a sleeping bag to a quilt and ridding myself of the jacket, gloves, hat, etc. I’ll continue to reevaluate that thought. Tomorrow is another deli day as we pass through Lickdale,PA, a truck stop haven. Tomorrow’s destination is the 501 Shelter, one of those tricked out shelters with ambiance to spare. I’ll take some pics. 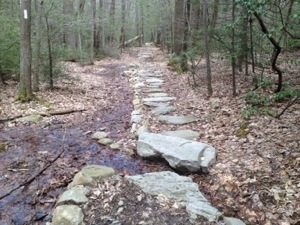 Walked over some excellent stone work throughout the day built by the Susquehanna Trail Club. 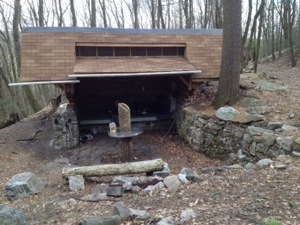 This stuff was built over years and years – it’s hard labor. 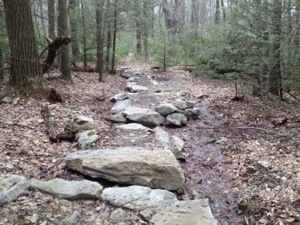 Today’s photo is of a raised trail bed with parallel drains. It’s in an area where the water springs from the ground everywhere. The Rausch Shelter is the most uniquely designed one yet. Someone was very creative. Best of all, the water is 10 feet away! I’m with three section hikers, two ladies from norther Illinois and one from upstate New York who was also at last night’s shelter. I looked up your location in G Maps. Looks like you are making good progress. Weatherwise…it looks like rain is coming Monday thru Thursday. Yuck. I’m going to hike tomorrow (Tue.) but zero for Wed. T-storms. I’d be on an exposed ridge line. Not a good place to be. You never want to be the tallest object in a t-storm. Not to mention carrying trekking poles. As a golfer, I concur. The rains are getting into PA now. They roared through easter IA Sunday afternoon with 2.4″ here along with 50 mph winds. About 1.5″ fell in less than 30 min. Quite a lot of cloud-ground strikes. A ridge line would not be a good place to be.